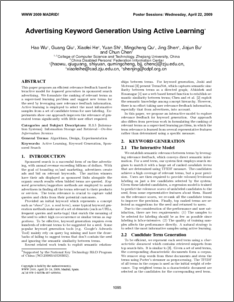 This paper proposes an efficient relevance feedback based interactive model for keyword generation in sponsored search advertising. We formulate the ranking of relevant terms as a supervised learning problem and suggest new terms for the seed by leveraging user relevance feedback information. Active learning is employed to select the most informative samples from a set of candidate terms for user labeling. Experiments show our approach improves the relevance of generated terms signiﬁcantly with little user effort required.